Bobi Dodevski wasn’t supposed to be working on the rainy March day when he met his future wife. Mr Dodevski, a 35-year-old Macedonian border guard, had agreed to cover for a colleague. Among the thousands of refugees hoping to cross the border that day was Noora Arkavazi, a young woman who had travelled with her family from Iraq. Ms Arkavazi, 20, left her home in Diyala, an eastern province of Iraq beset by violence, early in 2016. Alongside her parents, brother, and sister, she followed a well-trodden path west – crossing the border from Iraq into Turkey, taking a boat to the Greek island of Lesbos, and eventually entering Macedonia. There, as the family waited to learn if they would be allowed to cross into Serbia, she met Mr Dodevski. He saw something special in her eyes. “It was destiny,” he told the BBC. 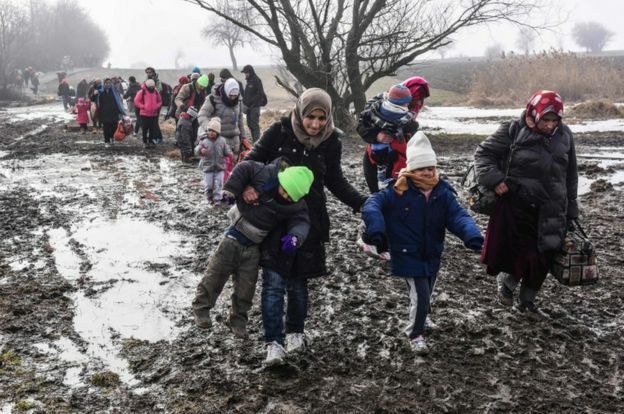 When the couple met, the fate of the refugees in Macedonia was hanging in the balance, as Balkan countries closed their doors to migrants. “I had a simple dream to live with my family in Germany,” Ms Arkavazi told the AFP news agency. She speaks six languages, and when she arrived at the border unwell she was directed to Mr Dodevski because of his English skills. Mr Dodevski attempted to remain professional, he said, but a female colleague quickly spotted the signs of cupid’s arrow.